CRM MVP Mitch Milam is our guest blogger today. Read Mitch’s blog. 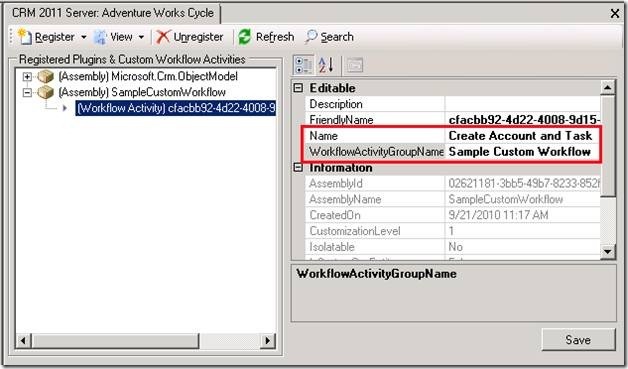 I recently upgraded one of my custom workflow activity plugins to CRM 2011 and thought it would be an interesting exercise to walk through that process with you. So let’s walk through the changes, from top to bottom. “Decorating” a Lookup property to show the label “Marketing List” in the Workflow user interface. Since it is a lookup, the lookup is referencing the list Entity, which is a Marketing List. The class definition has changed slightly due to the change in Windows Workflow versions. Beside the base class changing from SequenceActivity to CodeActivity, you will notice the CRM 2011 version does not have the “decorations” that specify the group and name that will be displayed within the CRM workflow editor. More on that later. The Execute method remains the sole method required for a custom workflow activity though the Context parameter and return value have changed. Accessing the values found within the input parameters is slightly different in CRM 2011 where the value of the parameter is not actually extracted until you actually need to use it. In CRM 4.0, that process happens more or less automatically due to the DependencyProperty setup. After you have all of the above code in place, the remainder of your code should function as it did in CRM 4.0. I did not have to make any changes to my code once the “plumbing” was upgraded. The registration process is exactly the same between versions: You use the Plugin Registration Tool. The biggest difference between the two is in CRM 2011, the Plugin Registration Tool is where you specify how the custom workflow activity is displayed to the user within the workflow editor. Note: Even though the above figure doesn’t show it, the FriendlyName and Name properties need to be the same. Well, that is about it. It probably only took me 2 hours to perform the upgrade of my code and that was starting from scratch with zero knowledge of the process. I just reviewed the SDK documentation and sample code and worked through each issue as it was encountered.